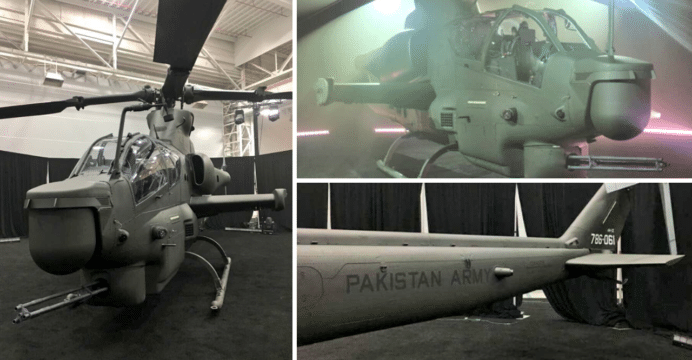 Photos of an apparent Pakistan Army Bell Helicopter AH-1Z Viper attack helicopter indicate that Pakistan will be taking delivery of its first batch in the coming weeks (or potentially sooner). In June, Bell Helicopter’s Vice President of International Military Sales Rich Harris announced that Pakistan would receive its first three AH-1Z by the end of 2017. The remaining nine will be delivered in 2018. The U.S. had approved the sale of 15 AH-1Z attack helicopters, 1,000 AGM-114R Hellfire II anti-tank guided missiles (ATGM), spare engines, maintenance support and training under a $952 million U.S. deal. Pakistan ordered three and nine aircraft in August 2015 and April 2016, respectively. The AH-1Z Viper is the latest iteration of the twin-engine AH-1W SuperCobra platform, the mainstay attack helicopter of the U.S. Marine Corps (USMC). The AH-1Z is powered by two General Electric T700-GE-401C turboshaft engines – each generating an output of 1,800 shp – with maximum take-off weight of 8,390 kg and payload capacity of 16 ATGM. The Viper also has 84% technical commonality – in the form of engine, rotor system, drivetrain, electronics systems and cockpit panel/displays – with the Bell Helicopter UH-1Y Venom utility helicopter. As a result, the USMC can operate the mixed Viper and Venom fleets with limited logistics and maintenance strain. Like its USMC counterparts, the Pakistan Army’s AH-1Z will come with Thales TopOwl helmet-mounted display (HMD) systems, Lockheed Martin AN/AAQ-30 Target Sight System (TSS) electro-optical and infrared (EO/IR) pods and BAE AN/ALE-47 countermeasure suites, among others. The Pakistan Army has effectively begun its process of refreshing its attack helicopter fleet, which is built of mainly legacy AH-1F/S Cobra helicopters. Pakistan also has four Russian Helicopters Mil Mi-35 assault helicopters on order, delivery is scheduled to occur by the end of 2017. In tandem with the Viper, Pakistan is also to begin negotiations with Turkish Aerospace Industries (TAI) for 30 T-129 ATAK attack helicopters. Each of these platforms will confer the Pakistan Army with integrated targeting and attack capabilities. For example, the Lockheed Martin TSS EO/IR pod can laser-illuminate targets – moving and fixed – for the AGM-114R to engage. The T129 uses the Aselsan ASELFLIR-300T and Roketsan UMTAS/Mizrak ATGM. This lessens the need for using a supporting scout, such as the Airbus H125m Fennec, for lasing targets for ATGMs. In turn, the H125m Fennec could be repositioned as a situational awareness asset, perhaps by deploying millimetric wave radars or synthetic aperture radars. Separately, the Pakistan Army and Pakistan Air Force (PAF) have also taken delivery of their respective Leonardo AW139 utility and search-and-rescue (SAR) helicopters. The PAF’s AW139s are equipped with FLIR Systems EO/IR turrets, though the specific model is not known. It could be the Star SAFIRE III as the PAF has been using that EO/IR pod from its C-130Bs since 2009.